Bitcoin is volatile. It's a hot new speculative vehicle with lots of press but low market capitalization. Until it achieves much higher investment, the price is at the mercy of individual large investors (like the Winklevii) who have the ability to pump-and-dump repeatedly at will. In the past few days, the price has seen a massive jump from the $130 range to above $200 (price depends on exchange). This morning the price has settled around $170. Because of the approach of Pluto to the Bitcoin Sun and first-solar-return Venus, I'm expecting a general upward trend until the transit peaks in January. At the peak, I suspect the price will go vertical -- probably upwards but maybe down. In the meantime, we'll probably see the kind of jerky movements of recent days. Transiting Chiron quincunx the Bitcoin South Node: Chiron is wounding/healing/adjustment and the South Node is (often) loss. Transiting Sun trine transiting Neptune, the latter of which is conjunct the Bitcoin Venus. Translated literally: this day (Sun) brings dissolution (Neptune) of value (Venus). Neptune continues a retrograde approach to the Bitcoin Venus but stations direct (as does Chiron) next month. 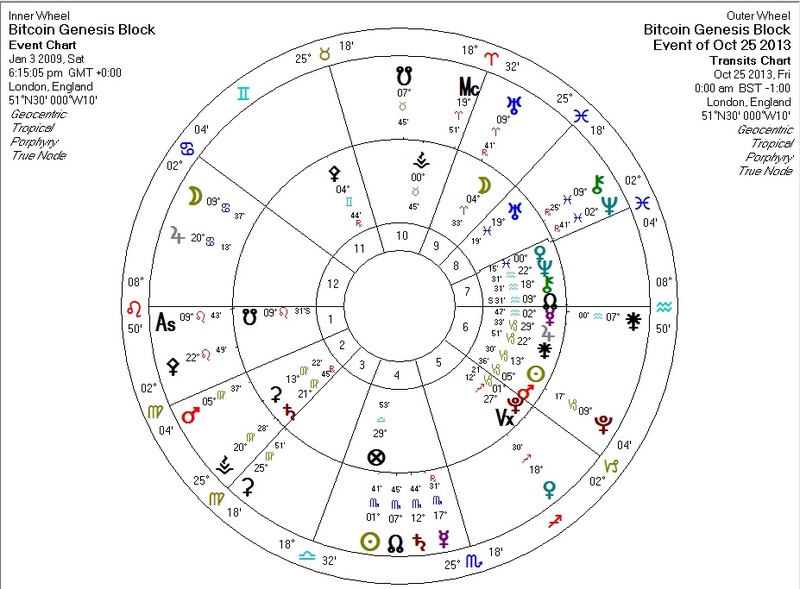 Transiting Venus (representing Money) square Bitcoin's Uranus (representing unpredictable movement, and also technology). This one peaks in the next 24 hours but in any event is a very transient factor. If these Neptune/Chiron factors continue to afflict the price, one might expect the affliction to lift in November after both planets station direct and start moving away from the points they affect on the Bitcoin chart. I am not a financial astrologer, so while I have been able to correctly guess some of the major movements this year, I reserve the right to be dead wrong.